How to see auto startup programs in Windows 10 (Apps)? The simple solution how to see auto startup programs and Application in Windows 10, this example is also for Windows 8.1! But in Windows 10 and 8.1 you can find the auto startup programs and Applications in the Windows Task manager and for example simple change the auto start settings in this case the program DesktopOK. Please start the Windows 10 Task Manage for example with windows 10 keyboard shortcut CTRL + SHIFT + ESC. Select the Tab Startup in the Windows Task Manager and enable or disable the autostart of a Program or Application in Windows 10. At this point: You can also open the file location of the auto start program or search online for informations to this program and see the properties information of this program or application. (Image-1) Change auto startup program and APPs settings in Windows-10! 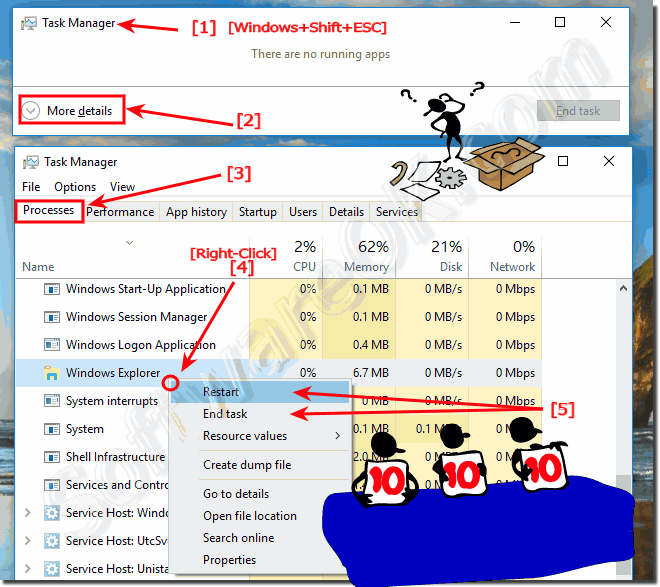 The list of applications that run when the windows 10 computer starts up, along with the name of their publisher, the path to the executable file, and the location of the registry key or shortcut that causes the application to to run at Windows startup. 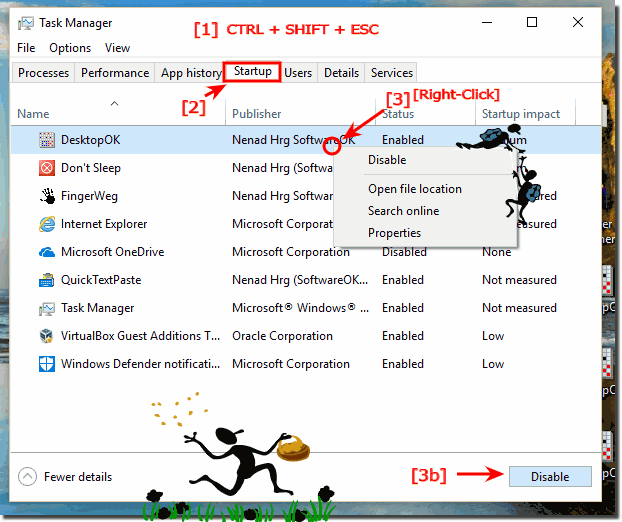 Enable or Disable programs for a startup item to disable it on your next startup. If you've chosen Selective startup on the General tab, you must either choose Normal startup on the General tab or select the startup item’s check box to start it again at startup. Note Disabling applications that normally run at startup might result in related applications starting more slowly or not running as expected. (Image-2) Terminate o Restart Programs in Windows-10! File Explorer Folder Options in Windows 10, how to find, open? Remove a program from startup in windows 10 for all users? Find program to startup folder windows 10? Windows 10 how remove a program to autostart? Where is autostart programs overview in windows 10? Windows 10 how do I find programs auto start settings? Windows 10 auto start applications? Where are auto start settings in windows 10? Windows 10 apps disable auto startup? How to remove or disable a auto start of program on windows 10, where is the settings? How to change auto start of progroams in windows 10? Where is the auto start settings in windows 10? Diosable the launch of a program windows 10 startup? Autostart program in windows 10? Identifying all startup programs in windows 10? Why start programs automatically in windows 10?